The crash of the Hungarian forint had us all on edge this week. The ripples went out to neighboring countries and the Eurozone as a whole. The Hungarian Prime Minister, Viktor Orban became globally known by his local name, ‘Viktator.’ With these economic waves, the international press woke up to the disappearance of democracy and failed economic policies in Hungary. The currency collapse and the removal of checks and balances between government institutions, along with the high speed erratic-drunken-like policy making that marks the Orban regime, is nothing new to us locals. But what is so great about Orban taking Hungary over the cliff of rationality is what it exposes for the modern state system: Erratic dictators are controlled by an international regulatory regime that requires stability, predictability and fairness. Orban went against every tenet of this system in his nationalistic power grab. Foreign companies and Hungarians themselves are all paying more for Orban’s ‘rebirth’ as Hungary’s nationalistic savior. The politicization of key government and regulatory institutions (judiciary, finance, energy, media, etc.) and the removal – or simple lack of professional knowledge, erodes these key tenets and forces the country into a downward spiral of economic and political demise. In short order Orban himself caused the currency to collapse. He failed to restructure the state to meet modern economic challenges – instead restructuring it to meet his vision of a nationalistic ‘independent’ state. He did this through the politicization of economic and social policy, and the cementing of these failures into the country’s constitutions. Collectively, these changes doom the country for generations to come. Regardless of what international institutions can force Hungary to change under the pressure of complete economic collapse – a collapse Orban may even accept with his North Korean style nationalistic ideology. Orban drives the Hungarian economy off the road. Others will point to the Eurozone crisis as playing a part for Hungary’s economic collapse. If a drunk driver hits a person crossing the street, is it the pedestrian’s fault – or the drunk driver’s? A sober driver may be the most boring person at a party, but at least they will get you safely home. And that is why we need professional regulators sitting in independent regulatory institutions. The key players in the Eurozone are financial regulators and central banks – each a professionally managed and independent institutions buffered in various forms from political interference. These are the ‘guys’ you want to drive you home. More broadly the European Union and global modern governance is based on independent regulatory institutions. There independence is secured through how directors are removed or term length, there mandate is to serve the people. Because of this mission, their appointment process should be as depoliticized as possible. They should also reflect local characteristics of each country’s political and historical system (appointments by monarchs are possible). But since Orban is not officially yet the King of Hungary, we can view him as a political actor. The global regulatory regime, or ‘regulatory capitalism,’ for David Levi-Faur, holds distinctive characteristics separating it from previous regulatory eras: stronger autonomous agencies, new technologies of regulation, new national and international regulatory layers. The “hegemony of neoliberal ideology” is more discursive, as capital is constrained through a regulatory regime (Levi-Faur 2005, 27). While Levi-Faur looks at the role of capital we can use Hungary to help us make the link to the political actions of the state. The charts below demonstrate the rise of regulatory institutions in the EU. These were created to provide a professional policy environment in increasing complex fields that require complex understanding of each sector. This also corresponds with the integration of the EU (or previously the European Community). Globally, the rise of regulatory institutions is mirrored – therefore we can can describe the rise of a global regulatory system. The Viktator of Hungary has decided to stand up against these international and national regulatory institutions and politicize the depoliticized technocratic regulatory institutions (i.e. serving the bankers alcohol). He is taking the rug out from under global regulatory capitalism, and forcing it to operate within an unpredictable policy and regulatory environment. The leaked conditions that the IMF has proposed Hungary follow to secure a new financial agreement represent not just good economic practices but re-enforcing and re-institutionalizing a more stable regulatory order. The IMF conditions in blue represent the conditions necessary for global regulatory regime to operate. (As a daily rider of Budapest’s public transport company, BKV, and as such a consumer of carbon monoxide inside the bus, I welcome a long-term vision of financial stability and investment in public transport too.) These conditions lay bare the role that independent financial institutions play in overseeing a country’s economy. They also indicate the areas where the Orban regime has failed to provide professional leadership. Reinforcing the failure of abiding by the rules of the regulatory regime – in the social sphere is Hungary’s year old media law, completing Orban’s control over public discourse. Even here, in an in-depth comparative report on Hungary’s media law done by Central European University, shows the new media regulator fails in every respect to uphold the public good and emerges as a political tool of the Orban regime – and is not an independent regulator. The former PM Viktor Orban puts out an engine fire on his bus. 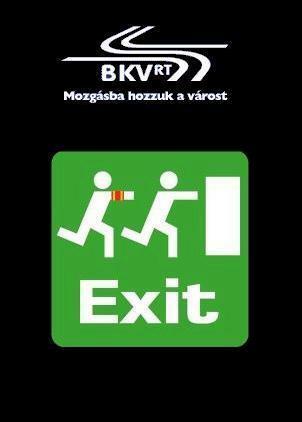 After being ousted as PM in 2012, Orban became a bus driver at BKV. In an article that I’m writing on the diffusion of regulatory practices in the energy sector, I emphasize how international best practices that guide regulatory making are localized within social, institutional and political arrangements within each country. This must occur in order for these institutions to be effective and to reflect the needs of citizens. There is a strong debate that these regulatory institutions are anti-democratic and remove democracy from key social and economic actors. What is clear in the case of Hungary, it is this global regulatory regime, and even international capital, are saving Hungary’s democracy. Or at least attempting to save it. For as much as the IMF can impose financial conditions necessary for Hungary to be bailed out, it is the political support and demands of the EU that will serve the citizens of Hungary in supporting to have democracy partly restored. Maybe the laws on media, judiciary and finance will be amended in the short-term. However, Hungarians will still need to remove the Viktator and his regime from power and re-institute the broader system of checks and balances. Hungarian voters themselves must re-establish democracy in the country. No global or international coalition of institutions and governments can provide the localized and contextualized institutional and social arrangements that a national civil society can develop. So while Orban has given the finger to the international regulatory regime, it is the actors in this regime and the Hungarian people that will have the last word.